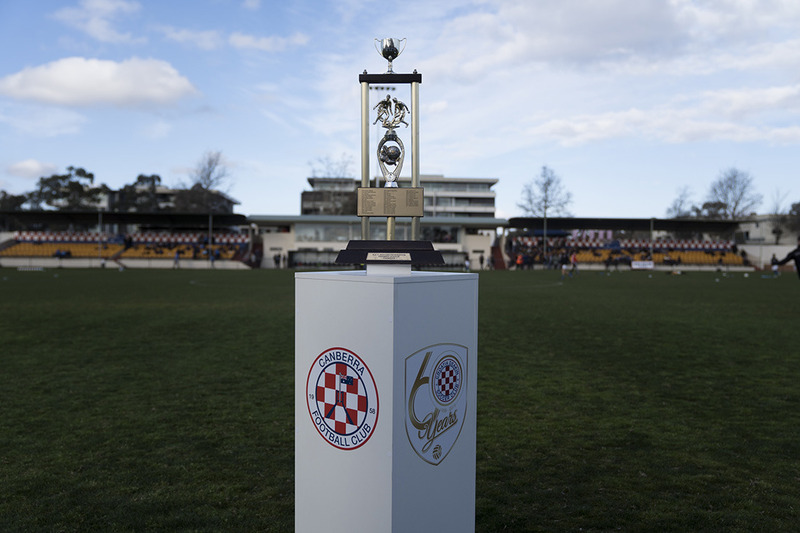 Canberra FC will be looking to pick up their first piece of silverware for 2019 ahead of defending the treble, when their 2019 campaign kicks off against Gungahlin United in the Charity Shield on Friday night at 6:30pm. But head coach Luka Ujdur has stressed to his team the importance of consistent hard work and that the team can’t rest on its laurels from last season. “We’ve been working hard on putting that aside and saying that is what we’ve done last season, this is a new season,” said Ujdur at the National Arboretum during the Capital Football NPL season launch. "We’ve got a new philosophy on how we want to play and what we want to do. “If we can replicate last year, we would like to do that. The Deakin based club had a near flawless 2018 season that saw them bring in three pieces of silverware. In the league, they finished the Premiership season with twelve wins, two draws and two losses, while amassing a whopping goal-difference of +33. The club has also made several new signings, recruiting damaging midfielder Daniel Colbertaldo to further strengthen the side in 2019. “We’ve obviously brought in Colby, he has come over from Olympic,” Ujdur said. Canberra FC have also brought in Canberra United NYL youngsters Lucas Mauragis and Nikola Jadric. “They bring a sense of enthusiasm and they’re keen in everything that they do. Their first chance to lay down a marker arrives on Friday at Deakin Stadium, where they will take on Gungahlin for the first piece of silverware on offer this year. Ujdur is adamant that his side will be out to win the pre-season silverware. “We are playing for a trophy,” he said. “We’re looking at being as strong as we can for that day and walking away with the trophy. Ujdur’s side will then return to Deakin the following Friday night, where they will take on Canberra Olympic in a rematch of last year’s Grand Final to open the season. “We have a very good idea where we are at, but at a competitive level when you come out and play it becomes evident where you really are. Canberra FC will have to fill the void of losing 2018 Men’s NPL Golden Boot winner Thomas James, who scored 19 goals for the club. “Obviously TJ has moved on,” Ujdur said. “He’s had a strong start with the Wolves, it just goes to reflect on his ability and to show what he’s done here hasn’t been a fluke. James was not the only big name to depart Deakin over summer, with Kofi Danning heading to rivals Canberra Olympic and defender Ross Costanzo landing at Gungahlin United. “Kofi moved on to Olympic, which is a bit of a surprise for us,” Ujdur said at the launch. Ujdur admitted he is unsure how this season will play out, and which teams will be the big improvers in 2019. “I’m hearing about a lot of [player] movement, [but] I haven’t really paid too much attention,” he said. Ujdur is anticipating the large volume of player movement will lead to a more balanced competition this season. “Monaro are wanting to show their worth this year and they’ve gone and recruited significantly,” he added. Ujdur is looking forward to an added level of competitiveness that he believes the introduction of promotion and relegation can bring, especially after seeing it demonstrated overseas. “It’s obviously a fantastic thing, promotion and relegation creates an environment where the fittest survives,” Ujdur said. “It also puts those clubs struggling in the top tier on notice. The 2019 Charity Shield will kick off at 6:30pm on Friday night at Deakin Stadium, and will be streamed live via BarTV Sports. All matches of the 2019 NPL, NPLW and NPL1 20’s Capital Football season will be livestreamed on BarTV Sports.